Kanye West’s latest album is making headlines in the news, and this buzz is directly translating to various pirate site. 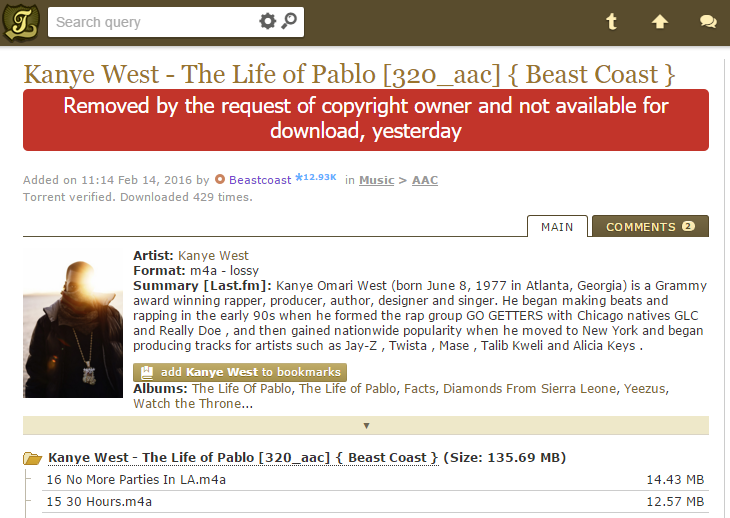 Over a half million people have downloaded a pirated copy of The Life of Pablo a day after its release, in part fueled by the album’s limited availability. In a surprise move West released his albumexclusively on Tidal and his personal website. This limited availability angered many fans who refuse to sign up for an expensive monthly subscription. And even those who signed up for Tidal had issues getting their hands on the album. Tidal’s support desk has been flooded with complains from people who failed to receive a copy due to issues with the service’s payment system. On the flip side, Tidal most likely received tends of thousands of new subscribers, so it’s hard to draw any strong conclusions in terms of revenue. But perhaps Mark Zuckerberg can jump in if the results are disappointing.